Lavender Mint - (mentha aquatica 'lavender') Very fragrant mint variety. Useful in potpourri, boquets, wreaths, etc. 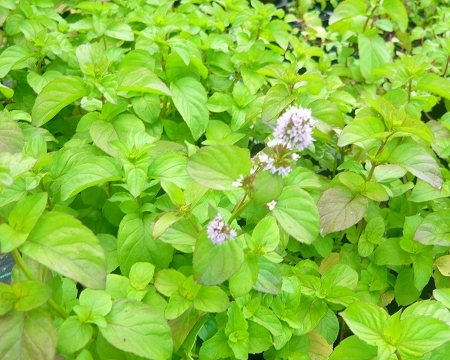 Small rounded leaves similar to orange mint in appearance, heavy perfumed scent. Pretty lavender colored flowers when in bloom. Makes a nice container or hanging basket plant. Easy to grow perennial zones 5-9. Live starter plant in 3 inch container. I received this lavender mint about a week and a half ago and potted it a week ago. It looked very healthy when I received it and the scent was delightful! I followed all their instructions they sent with it for repotting it and it looks just as healthy now as when I received it. Highly recommended! Smells similar to orange mint and basil mint with a hint of lavender. Grows good.